Hermann-Paul, born in Paris, studied at the École des Arts Décoratifs and at the Académie Julian where he was the student of Henri Lerolle and Gustave Colin. He soon made a name for himself as a painter of genre scenes, a printmaker, illustrator, and draftsman. He was elected a member of the Salon d’Automne, and became a professor at the École des Beaux Arts in Paris. 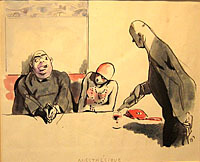 He was known for his satirical drawings which poked mild fun at the bourgeoisie. He kept his career as a painter quite separate from his work as an illustrator, and his canvases owed a great deal to Cézanne whom he greatly admired. He exhibited with the Nabis, including Bonnard, Vuillard, and Denis. Hermann-Paul was known for his albums of prints. Among the best known were La Vie de Monsieur Quelconque and La Vie de Madame Quelconque, two albums of ten black and white lithographs each, published in 1894 and 1895. He was one of a group of French artists in the late 19th century who used both traditional printmaking processes and the new photomechanical relief-printed imagery to disseminate their images as widely as possible. 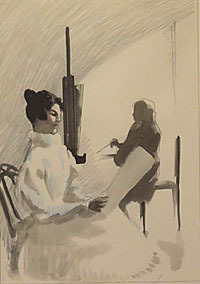 The group included Théophile Steinlen, Henri Rivière, Henri de Toulouse-Lautrec, Edouard Vuillard, Pierre Bonnard, and Félix Vallotton. 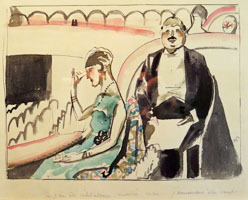 His illustrations appeared in the leading Parisian journals of the day, including L’Assiette au beurre, Le Canard Sauvage, Candide, Le Courrier Européen, Le Courier Français, Les droits de l’Homme, L’ Escarmouche, L’Homme Libre, La Vie Parisienne, Le Rire, Le Figaro, and a number others. Among the books he illustrated were works by Gabriele d’Annunzio, Émile Zola, François Villon, Gustave Flaubert, and Rabelais. Provenance: Hermann-Paul family collection sale in Chartres, France, on October 23, 2000. Signed with a monogram, lower right. Sales stamp on verso.